Oatmeal provides whole-grain fiber that can help lower cholesterol, decrease the risk of heart disease and help combat constipation. Adding oatmeal to cookies, breads and muffins is a good way to add fiber to your child's diet. Oats are also low in fat and calories. You can use old-fashioned oats in place of quick-cooking oats in most recipes and meals. The only difference between old-fashioned and quick-cooking oats is the way they're cut. Both are steamed and flattened between rollers. Quick-cooking oats are first cut into smaller pieces to reduce the time it takes them to cook. When making oatmeal, old-fashioned oats take about 15 minutes to cook on the stove, while quick oats only need about 5 minutes of cooking. Half a cup of cooked oats, either old-fashioned or quick, has 80 calories, 1 1/2 grams of fat and 3 grams of protein. A serving of oats provides 6 percent of an adult's daily requirement of iron and some calcium. Adding skim milk, nuts or dried fruit to oatmeal increases its nutritional content. 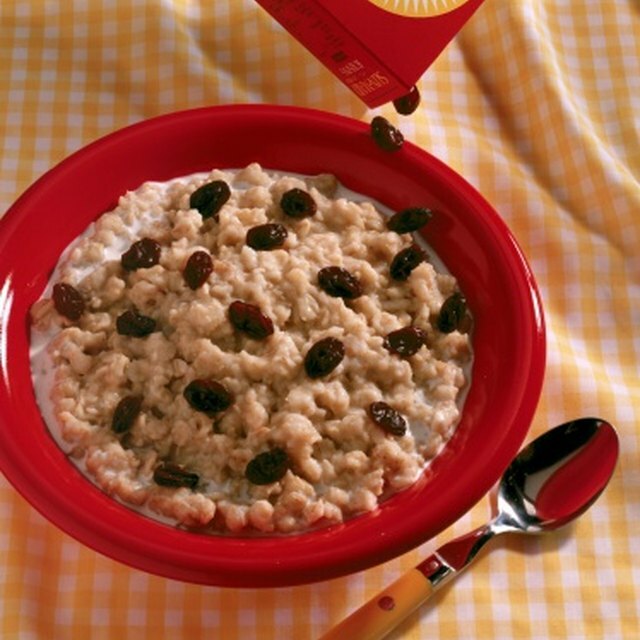 Let your children add their own toppings to oatmeal to make it more of a treat. One cup of cooked oatmeal contains about 4 grams of fiber. When substituting old-fashioned oats for the quick-cooking variety in baked goods and other recipes, the finished product may be a little chewier. Some people prefer this for cookies, breads and other recipes. If your kids prefer a softer texture, you can pulse old-fashioned oats once or twice in the blender or food processor to turn them into the equivalent of quick oats. Increasing the cooking time of a recipe for a few minutes may also reduce chewiness. You can use quick or old-fashioned oats as the starch in meatloaf or instead of bread crumbs to coat fish or chicken. Swap out 1/3 to 1/2 cup of flour with oats in a favorite recipe for bread to add flavor and fiber to your bread, and add a packet of seasoning mix to further enrich the flavor. Oats mixed with brown sugar and a little butter make a crunchy topping for a fruit crisp. Quaker Oats Health Institute: Did You Know?